(March 17) - Geographically dispersed and riven with disputes, could America's Orthodox Jewish community ever recognize the authority of a national rabbinical court? Last month, a rabbi-lawyer from Atlanta took a startling shot at American Orthodoxy. "Orthodoxy has become like the Wild West," alleged Michael Broyde at a conference in New York sponsored by the Modern Orthodox group Edah. "Might makes right, because there's no sheriff around. There's no system of justice." There is no religious court system with the ability to govern the Orthodox community, claimed the lecturer at the Emory University Law School in Atlanta, because the community is not cohesive and participation in religious life is voluntary. Broyde, formerly director of the Beit Din of America, affiliated with the Orthodox Rabbinical Council of America, called this a major structural problem in the American Orthodox community. He likened the problem of US rabbinical courts to the system of kosher-food supervision in the US from the 1930s to the 1950s. Until supervision was centralized by the Orthodox Union, he recalled, it was chaotic, inconsistent and prone to fraud. A book on the dark days of kashrut supervision was titled Holiness and Corruption. In the future, Broyde said, there might be a book with the same title about the contemporary rabbinic courts, which are of uneven quality and integrity. Broyde's notion of a "sheriff" for the Orthodox "Wild West" is a national beit din that would restore law and order. His idea for a national court would also, Broyde suggested, serve as a long-term solution to the problem of agunot, women whose husbands will not give them a get or religious divorce. In fact, he believed, agunot could become the idea's strongest advocates, because they are the only ones bound to use a beit din. No one, for example, can compel parties to a commercial dispute to resolve it in a rabbinical court. For agunot, on the other hand, there is no alternative arena to obtain a get. The root cause of the aguna problem is the inability of the religious courts to regulate the end of marriage, Broyde said. The courts, he said, must be reconstituted "to make them honest, competent and understanding." Another advocate for a national religious court is J. David Bleich, a professor at the Benjamin Cardozo Law School of Yeshiva University and a yeshiva head at YU. Bleich said such a court was needed to contend with divorce and domestic relations, but added that the impetus was the growth and prosperity of the American Orthodox community. "We have more commercial relationships with each other. Partially it is a function of sheer numbers; partially it is a function of the fact that these people are no longer working in sweatshops on the Lower East Side," Bleich said. "They are entrepreneurs, and entrepreneurs have litigation." HOWEVER, Samuel Heilman, a professor of Jewish Studies at Queens College in New York, dismissed the idea of a national beit din - in part because American Orthodoxy is fractured. "When we talk about Orthodoxy, we are not talking about a national movement per se," said Heilman, author of Defenders of the Faith: Inside Ultra-Orthodox Jewry, "we're talking about something that has outposts in different areas; and there are different standards in some respects." "For a beit din to operate, it goes beyond Halacha. It has to deal with community standards, and there is not a national [Orthodox] community. "Orthodoxy in New York is a different animal than Orthodoxy in Memphis, Tennessee, certainly different than Orthodoxy in LA - and even different than Orthodoxy in places like Baltimore, Washington or Boston or Philadelphia. "Each of these places marches to its own drummer, and the idea of a national beit din is more a reflection of wishful thinking." Bleich, who advanced the idea of a national beit din four years ago in the fourth volume of his book Contemporary Halakhic Problems (published by Ktav), contends that it would solve a problem caused by the geographical dispersion of Orthodox Jews across the US. "You have a person who lives in California, one in Ohio, they want to sue each other, where are they going to sue?" A national beit din, he said in an interview, would have jurisdiction across all states. This would also work in cases in which a member of one hassidic community wants to sue someone in a different hassidic community - or a non-hassidic community - when they would otherwise be unable to agree on which beit din to use. Competing centers of religious authority could each designate potential members of the beit din, Bleich said, creating a pool of judges from which litigants could choose to sit on their cases. "If all the various centers of religious authority have agreed that these are people they are willing to accept, you've gone a long way toward solving that problem," he said. But it is a "long way" that is barely imaginable, as there is no cadre of rabbinic sages that would have national legitimacy across sectarian lines. The major problem, though, is not the absence of sages, but the failure of the American Orthodox community to recognize the necessity for such a beit din. For a system to be just and authoritative, it has to cover the entire community, not simply those who choose to participate. 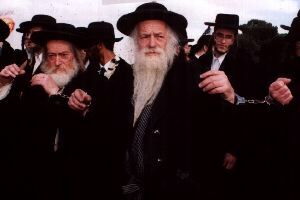 Orthodoxy is a social movement whose rabbis have only moral authority and cannot compel compliance, Broyde noted. Each individual can choose his own rabbi, follow the decisions of that rabbi - and if he doesn't like the decisions, he can find another rabbi. If he is unhappy with one beit din, he can look for another around the corner. A CENTURY ago, religious courts historically had financial authority over the Jewish community and the power to regulate the conduct of Jews. That is not so in the American Jewish community. Even when the parties agree to take their grievances to a rabbinical court, the beit din - local or national - would also have a problem compelling compliance with the rulings because the courts have no enforcement powers. "Once you have a national beit din, this is only going to work in the community of adherence," Bleich said. "[When] people [are] not interested in this, what sanctions do you have?" In most cases, the American religious courts can rely on civil authorities to help with enforcement, because the courts are recognized as "arbitration panels" by the civil legal system. But that makes many in the Orthodox world uneasy. They are averse to turning over a Jew to the secular system in order to compel him to do something that may be against his will, even if it was ordered by their own rabbinical courts. However, there have been cases in which the decisions of rabbinical courts are not enforceable in secular courts. According to New York attorney Irving Rotter, in these instances the courts have refused to enforce the religious courts' decisions not because there was a conflict between Halacha and civil law, but because the batei din did not comply with various procedural requirements governing arbitration proceedings. SHARON Shenhav of Jerusalem, an attorney who directs the International Jewish Women's Human Rights Watch which documents, researches and publicizes the circumstances of agunot, discounted the significance of a court's power of enforcement, no matter where it comes from. Addressing a panel at the Edah conference, Shenhav said the experience of agunot in Israel showed that the religious courts were unwilling to exercise the sanctions to compel recalcitrant husbands to give their wives a get. Sanctions have been at their disposal since 1995 but have been used only about 100 times, and more than half of those were taken by one rabbinical court, in Haifa. In the Tel Aviv rabbinical court, sanctions have been used only twice, Shenhav said at the conference, citing research by Rabbi Eli Ben Dahan, director of the rabbinical courts. "The last thing you are going to get in the rabbinical court is justice," she said, noting that couples are turning instead to the Israeli family courts, which are seen as more responsive. That would relegate the rabbinical courts to a ceremonial role. Broyde acknowledged this, saying: "Israel suffers from the problem of the sheriff that doesn't do well." He fears that American Orthodox Jews may bypass religious courts in favor of the civil court system, which they are confident is inherently just, and which appears to make the beit din irrelevant or even superfluous. Broyde cautioned that Orthodox values are not in sync with the secular family law. "We cannot be fully governed by secular law," he said. "Jewish law recognizes the law of the land; but we have values that are separate and distinct. We have ideas in common that produce different results. In a divorce case, "we can agree with the civil system that the best interests of the child come first, without agreeing on what the best interests would be." For instance, Broyde said, the secular courts may not take into account such big-ticket and fundamental issues as who should pay for day-school tuition for the child. There are other flaws in the American Orthodox beit din system that often seem to send individuals racing for the civil system instead. There are, for example, widespread rumors of greed and corruption, about which no one will speak for the record. The system is also undercut by reports of "dueling dayanim," in which judges act more as adversaries or advocates for one side instead of as impartial judges. Neither Bleich nor Broyde, the primary advocates of a national American rabbinical court, foresee one emerging in the near future. "Nobody is willing to invest the time and effort in knocking heads together to make it happen," said Bleich. "People are hurt by not having it - but the people who are going to provide the remedy or be the catalyst for providing the remedy aren't the people being hurt." More than a token victory? Can anyone prevent a split?